We’re at one of the greatest financial market inflection points since 1929. The market is down for the year… and headed much lower. But that doesn’t mean you have to lose money. In fact, it’s just the opposite. The $64 million question, of course, is always how can you know the direction? There are all kinds of financial advisers and market seers and chart readers and fancy investment formulas to report to answer to answer that question. All of these assume some kind of world in which the future unfolds in a grand cyclical continuum that’s anchored in past history. They’ll tell you that with the right pattern recognition software or system like they advertise on financial TV and you’ll make a killing. I recommend the latter. Put options are easy to use and an effective way to execute my bubble finance trading strategy. Here are the basics. There are two types of options: “Call options” and “put options”. Both give you the right, but not the obligation to buy or sell a stock at a certain price. You buy a call option if you think the market is going up. A lot of people have been making a lot of money doing that during the entire expansion of this financial bubble. You buy a put option — which I’m recommending to you — if you think market is going to fall. That’s our thesis. The market is going to fall further, faster, soon. Put options are a safe way to take a profitable position where the facts and analysis overwhelmingly suggest that a stock or exchange traded fund (ETF) is going to fall. I say they’re safe because you can never lose more than the money you pay for the put options. Your risk is limited. Meanwhile, if you bet correctly, you’ll earn your money back plus double or triple your original investment if the stock in question falls. The worst case scenario is that if your timing is wrong, or the market moves in the opposite direction you’ve bet you can lose all of the money you purchased the option for. This is the best strategy to use right now. Because the inflated market valuations of the past seven years have gotten so out of hand. 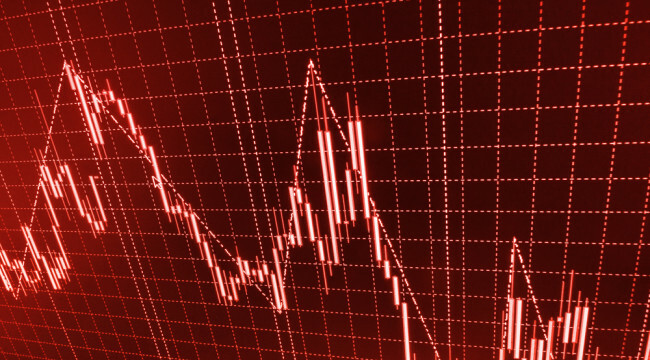 With the Federal Reserve raising interest rates and signs of recession spooking investors, you can expect the selling momentum in many markets — especially those that were most inflated — to intensify. So far, I’ve helped readers of my Bubble Finance Trader readers close out two trade recommendations: 88% in 30 days, on Viacom put options. And 54% yesterday with put options on the company WisdomTree which is in the business of creating exchange trading funds. And there are many more opportunities. I’ve taken the time to outline the most urgent opportunity right here. This is not to say that bubble finance trading is automatic or guaranteed. Don’t believe anyone who tells you their strategy is foolproof. But buying put options is the ideal way to profit in this new market environment. They can make you two, three and four times your money as the most overvalued stocks and ETFs take a big fall. The market is going down. That doesn’t mean it will go down every day (as I write this, for example, all three indexes are in the green), but there won’t be relief rallies. Rational investors in thought will drive the market, instead of robo-traders and machines. As 2016 unfolds and the recessionary forces become manifest in our economy, the markets will go even lower. There’s a company in particular that you should focus on right now. It’s one of four high-flying stocks essentially holding up the entire stock market. Think of it like the foundation of the stock market. When this stock starts to collapse in price it will take the bottom out of the whole stock market. Investors will hit the sell button on other stocks as the broad market starts to tank along with it. It’d be like dropping another A-bomb into the economy — since the rising stock market of the last seven years is one of the only signs of an “economic recovery.” But using the strategy I just outlined, you could make 300% on the opportunity. Click here to see all of the details. There’s no long video that you need to watch.